A couple of weeks ago, I jetted off to Marrakech for my first ever visit to Morocco. I’m what I’d consider to be fairly well travelled but nothing could have prepared me for what the city had in store. 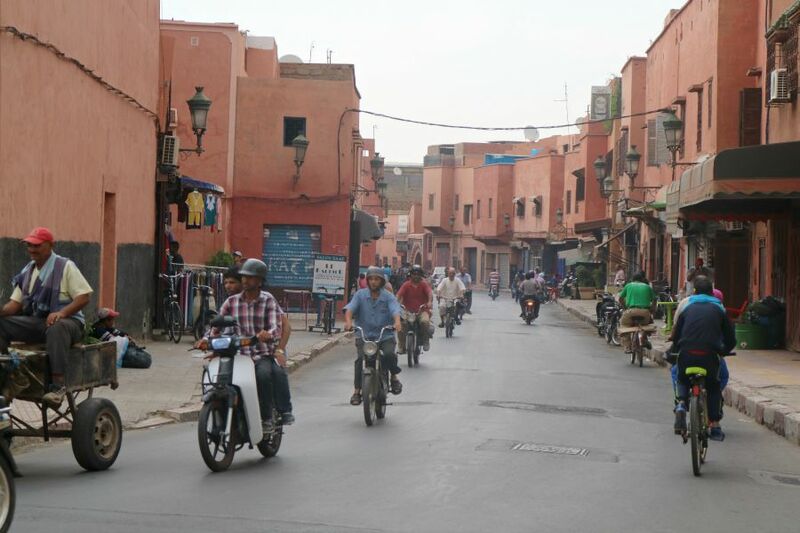 We soon labelled Marrakech ‘the city of contrasts’, it’s absolutely crazy in the winding streets yet perfectly calming once you’ve retreated back to your Riad. Some parts can make you feel as if you blend right into the scenery and others you feel as if you have ‘tourist’ stamped across your forehead. On arrival at Riad Papillion, which I’m going to go into further in my next post, we were greeted with fresh mint tea whilst our luggage was whisked off to our room and I couldn’t quite get over how the place felt like a little save haven amongst all of the winding streets. If you are planning a trip to Marrakech, there’s simply no way you should consider it without a stay in an authentic Riad. After spending a small fortune on spices, herbs, lotions and tea that most of which we didn’t need but felt obliged to buy, we were soon led out back to where we met an eccentric old chap making felt hats. Once again I was suckered into buying an odd looking necklace made from felt balls, and spent double what it was most likely worth, but that’s all part of being a tourist on your first day of Marrakech. On the second day, we wrapped up in scarves to cover our shoulders and went down to Jeema El Fna. I’m going to be pretty blunt here and say that I found the square to be incredibly intimidating and not at all an enjoyable place for two tourist women. I’d read up all about Marrakech before visiting, so was as prepared as I possibly could be but wasn’t expecting the uncomfortable atmosphere that greeted me. We stopped for the world famous orange juice, and within seconds a woman came over offering henna, to which we politely declined and then she insisted on giving me a small free design as I was “so beautiful”. Within an instant she grabbed my hand, covered it in badly drawn henna and demanded the equivalent of £8 for something I hadn’t agreed to. Luckily I managed to get rid of her with spare change and had hand wipes in my bag to get rid of it as soon as she’d scampered off. Tip: Claim you are allergic to henna, don’t go near the snakes or monkeys (animal cruelty alert), avoid eye contact unless you want to be sold something, be wary of pickpocketing, find the best orange juice stall, be respectful to the culture by covering your shoulders and below your knees. You simply cannot leave Marrakech without some form of rug or carpet, be it of the very high end and high priced variety or the more mass market versions. We picked up one to go under our coffee table that has neon coloured detailing for around £30, which after a long time haggling down from £70 was a good deal all round. Tip: Check for stains, take out a lighter if they have claimed it to be made of wool, aim for at most 1/2 of the starting price, shop around. My favourite aspect of Marrakech was just how easy it was to stumble upon wonderful places to eat. On one particular afternoon we were being pestered by a man telling us he would give us directions, that we didn’t want or need, so we decided to take a break and hide away for lunch. Four flights of stairs later, and we had a whole terrace to ourselves with views across every rooftop of the city accompanied by one of the most delicious meals I’ve ever had. There was vegetable tagine, cous cous, fresh bread, fig chutney, courgette pickle, harissa paste, onion marmalade, olive oil and of course a pot of mint tea. Tip: Don’t obsess over researching places to eat and simply see where the city takes you instead, the fig chutney is beyond words and was one of my greatest discoveries, the arabic word for thank you is “shukran” and is of course the most important thing you can learn before you arrive. Jardin Majorelle is a place so incredibly beautiful, serene and inspiring that if all you did was catch a flight to come and see it and return home it would be a trip well made. I am equally as obsessed with cacti as I am with the cobalt colour that surrounded them so it’s no surprise that I wandered round in complete awe. Tip: The cafe inside the garden has delicious food and beautiful surroundings, arrive early in the morning as you will have it almost to yourself, look out for the frogs and turtles. Henna Cafe | If you want henna done properly, chill out to good music, meet interesting people and dine on fresh and authentic food then this is the place to be. Plus all profits go back into the local community which all in all makes it my ultimate recommendation for where to eat in Marrakech. Le Jardin | We went here in the evening so I didn’t manage to get any photos but try and imagine Jardin Majorelle in restaurant form and all hidden behind a tiny wooden door attached to a wall by the souks. I opted for lentils with smoked aubergine and goats cheese which was honestly one of the tastiest dishes that I’ve ever eaten. If you’re sensitive when it comes to animals then don’t travel at the time of Eid as it’s when sheeps are sacrificed all across the city, leave at least two hours when departing from Marrakech airport, don’t ever ask directions from someone in the street as they will charge you for it and last but not least leave the modern world behind and immerse yourself in a city that time seems to have almost forgot.